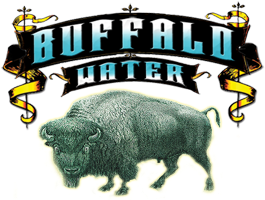 Another buffalo-inspired form of legal tender bears its mark on the neck label of Buffalo Water Beer Company’s Bison Blonde beer. The Indian Head Nickel, often referred to as the “Buffalo Nickel,” was the first of seven coins to feature the great American animal and will soon appear as the bottle cap for this flagship brew. So, what’s the story behind this piece of historic currency? The Coinage Act of April 2, 1792 would define the guidelines for all future coinage produced by the U.S. Mint. One part of the Coinage Act, or Mint Act as it was also known, mandated the reverse side of all gold and silver coins to feature an eagle and the inscription: UNITED STATES OF AMERICA. However, in 1890 a new act was introduced allowing then Mint Chief Engraver Charles E. Barber the power to change coinage design if a coin had been in circulation for at least 25 years. Barber now planned to redesign the silver dime, quarter dollar and half dollar coins. The new coins were introduced in 1892, much to the distaste of the public. However, the act of 1890 prevented the U.S. Mint from changing circulating coins in response to public dissatisfaction. This would change during the early 20th century when President Theodore Roosevelt (co-founder of the American Bison Society - now the National Bison Association) would crusade to improve U.S. coinage designs. 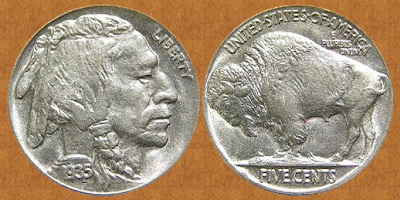 The first Buffalo Nickel, designed by accomplished sculptor James Earle Fraser, would be introduced by the United States Mint in 1913 and was minted every year through 1938, except in 1922, 1932 and 1933.
popularly known as the "Buffalo Nickel" by numismatists and collectors alike. 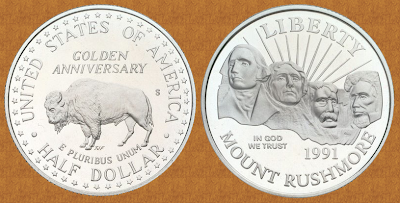 When the buffalo nickel was discontinued in 1938, the image of a buffalo would not appear again on U.S. coinage until 1991, when the robust beast would emerge on the Mount Rushmore Golden Anniversary Half Dollar Coin. 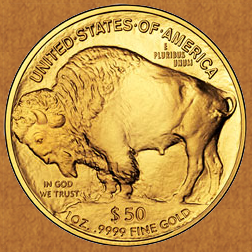 The buffalo would return again several times, most notably on June 20, 2006, when the United States Mint unveiled its 24-karat buffalo gold coin featuring the original Indian Head and Buffalo designs from the 1913 nickel. The first-ever U.S. Mint-issued 99.99% pure gold coins weighed one ounce and had a face value of $50, but sold at a considerable premium Most of these collectible coins sold for around $800 in 2006. However, you don't have to spend large amounts of money to see that famous American bison glistening in its golden coat. Instead, pick up a Bison Blonde Golden Lager for a lot less and observe a piece of numismatic history.